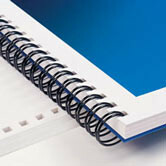 These wire combs are designed to allow you to produce wire–bound books using your plastic comb binding machine. Punch your pages with any plastic comb binding machine, insert the correct size 19 loop wire, and close with a wire closer. Use the built–in closer if your machine has one designed for wire, or use a separate wire closer. We also offer a large selection of Paper Cutters, Laminating Machines, Coil Binding, GBC Binding and Tape Binding Machines. Consult with our knowledgeable staff if there is a particular machine or product you require. All wire combs have 19 loops to fit an 11" binding edge. Wire combs may be cut to fit a shorter edge.